Outstanding Original Joe Jackson Oil Painting by Ron Stark – Measures Approx. 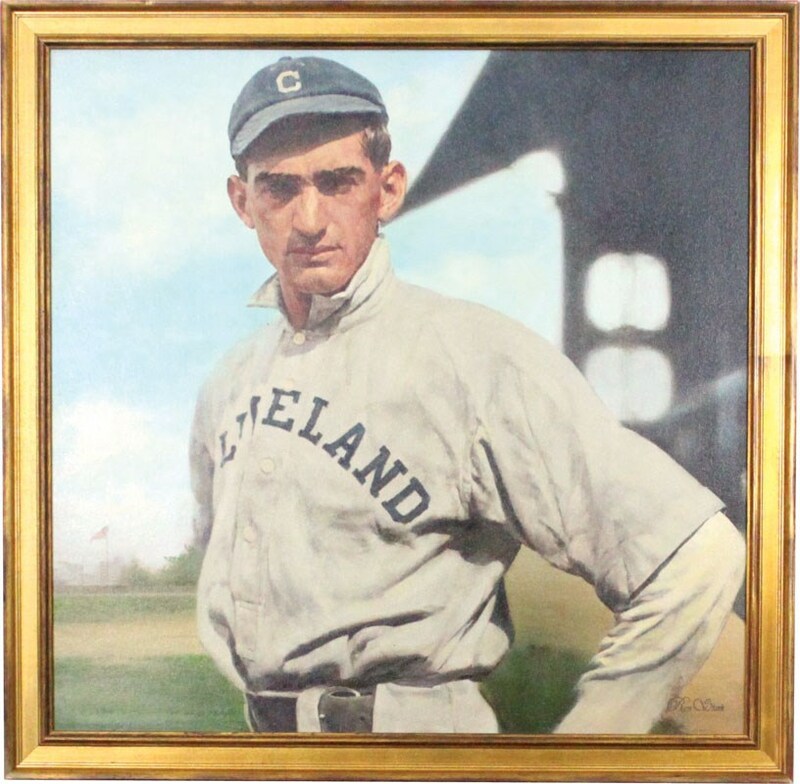 23" x 23.5"
Presented here is an extraordinary "Shoeless" Joe Jackson original oil painting by renowned sports artist Ron Stark. Measuring approximately 23" x 23.5" and framed to 26" x 26" dimensions, the iconic Jackson is donning his classic "Cleveland" uniform and cap that he wore for the first six years of his magnificent MLB career as his stoic look literally appears to be pondering what the future will hold for the young Cleveland superstar. The immense mystique of Joe Jackson ironically stems from his involvement in the "Black Sox" scandal that is embellished in baseball folklore, and not his unparalleled batting prowess. Jackson's "Black Sox" legacy far exceeds any Cooperstown inductee's renowned status with his involvement in "throwing" the 1919 World Series forever immortalized in baseball history and leading to the post-Black Sox phrase "Say it ain't so Joe"! Yet, even before this scandal, Jackson was idolized by a countless number of avid baseball fans who followed his superlative career. His "Shoeless" nickname, godly in nature, sends us back to his minor league playing days for the Greenville club in the Carolina Association when Jackson played without shoes due to painful blisters that had developed from wearing a new pair of spikes. The next game he played without shoes with only his black stockings covering his feet. During the game as he rounded third base after hitting a long home run, one fan finally noticed and shouted "you shoeless sonofagun"! A sportswriter picked up on this, printed it the next day, and the legend of "Shoeless" Joe was born forever. His awe-inspiring image on this museum worthy masterpiece can be traced back to the latter part of the 1908 season when Jackson was called up to the Majors by Connie Mack and made 23 plate appearances. Unfortunately for Athletic fans, "Shoeless" Joe was shuffled off to the Cleveland Indian's organization early in 1909 (after another 18 plate appearances with the Athletics), and after tearing up the minors for nearly two full seasons, Cleveland called up Jackson near the end of the 1910 season with history in the making. Jackson would embark on a career that would lead to an unfathomable .356 lifetime mark for both Cleveland and Chicago, prompting Babe Ruth to model his swing after him and Ty Cobb dubbing Jackson the best all-around player he ever saw, bar none! Imposing to say the least, Jackson looks as if he is about to "step out" of the painting into a batter's box for another bout with an overmatched pitcher. You can literally feel the intensity of Jackson's seemingly timeless pose, flanked by a period style grandstand over his left shoulder and a near-perfect "green grass/blue sky" background that serves as the quintessential setting for any National Pastime related illustration. 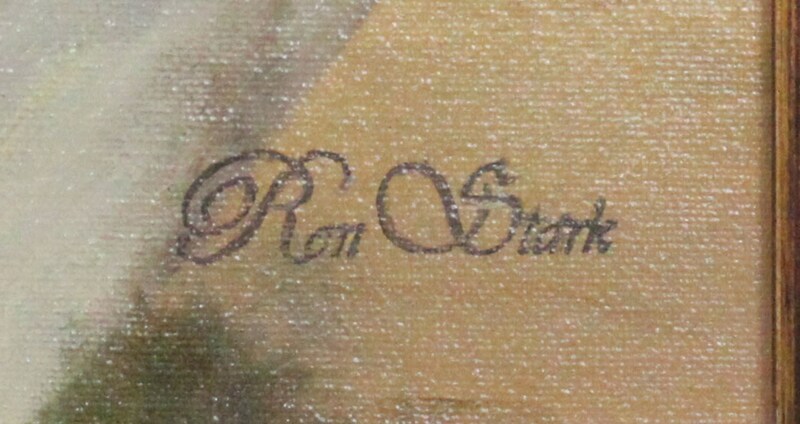 No painting could possibly reside as a more realistic image than this revered keepsake that stands as a typical benchmark for all of Ron Stark's magnificent works. The son of legendary cartoonist Bruce Stark, Ron has been regarded as one of the foremost sports artists since the early 1990's and has created a myriad of illustrations (both cover and interior related) for numerous sports publications. Simply stated, Ron Stark "oil on canvas" paintings are highly coveted throughout the collecting community, with only a handful of them possibly boasting the extraordinary prestige of this world-class offering. Regarding the legacy of "Shoeless" Joe, never could one imagine that a non-HOF inductee rate in popularity with the likes of Babe Ruth, Ty Cobb, Honus Wagner, etc., yet due to the "Black Sox" scandal, his popularity has increased profoundly. His solidified place in baseball folklore will "echo for eternity", substantiating why although we would not expect the most passionate collector to clear their property to build a "Field of Dreams", if you bid strong, this breathtaking Joe Jackson oil painting will surely come!